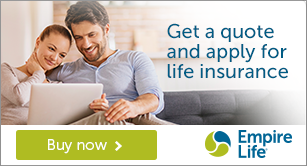 Empire Life, Life Insurance - Assurance Vie Michel Levesque Life Insurance - Serving: Bathurst, Beresford, Nigadoo, Petit-Rocher, Campbellton, Tracadie-Sheila, Caraquet, Shippagan, Miramichi, NB (New Brunswick). Empire Life has been in business since 1923 and is among the top 10 life insurance companies in Canada. They offer individual and group life insurance, health insurance and investment and retirement products. Empire Life’s products offer the same benefits as many of the other companies in the market. Empire Life offers participating life policies with guaranteed cash values. The also offer the added bonus of the potential to receive dividends each year. Although dividends are not guaranteed, Empire Life has paid dividends every year since 1923. How much cash would you like to leave to your beneficiaries? This process will determine the amount of insurance that suits your needs. If you are under insured, a death or change of health can be devastating to your family’s finances. Contact us for a free no obligation Insurance quote today! !